Story by Derek Ferrar. Photos by Ben Weller. I’m standing on a deserted, wind-blasted beach about forty miles southeast of Tokyo, looking out across dark gray sand at a hashed-up jumble of whitewater. Above: Under the lofty gaze of Mount Fuji, locals and "train surfers" from Tokyo flock to the Shōnan coast's twenty-five miles of fickle beach breaks. 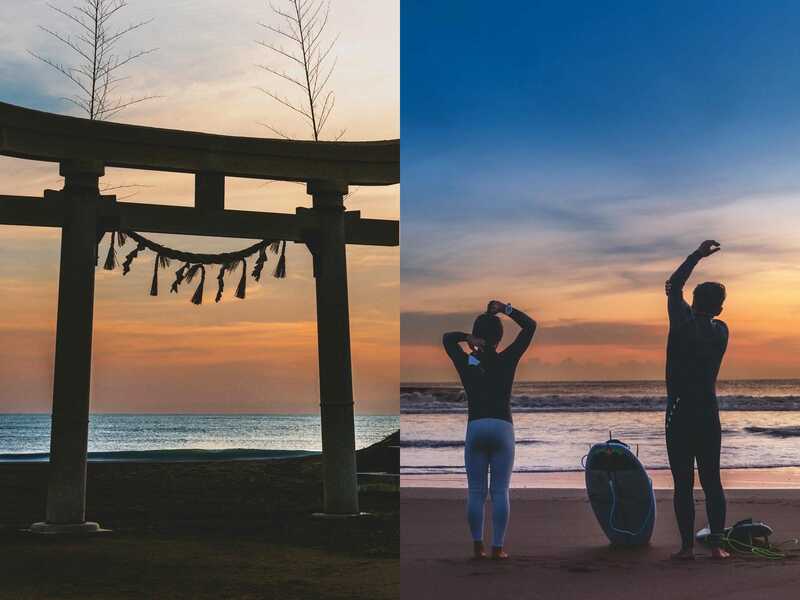 Left: a torii gate—traditional Shinto symbol of passage from the mundane to the sacred—stands in front of Shidashita Beach in Chiba Prefecture where surfing is set to make its Olympic deput in 2020. Right: Father-and-son duo Takeshi and Taisei Akiyama warm up before heading out for dawn patrol at "Shida". 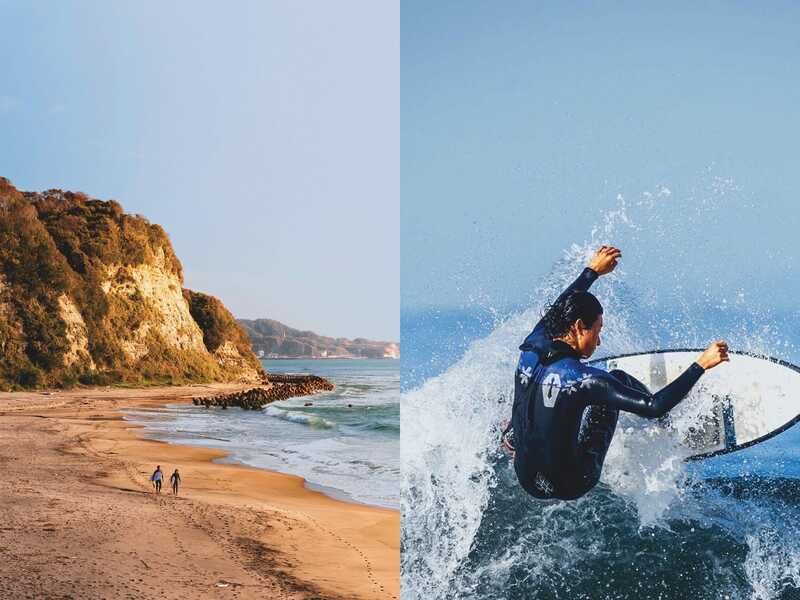 Left: Tucked at the base of limestone cliffs, Hebara beach in central Chiba is known as the "North Shore" of Japan for the variety and quality of the local surft spots, when it's going off. For a couple of decades starting in the early 1980s, the area was an annual stop on the world championship tour, with the sport's biggest stars roaming the sleepy little town's narrow streets and family shops. Right: Competitive surver Reon Oba gets above the lip at Kugenuma Beach in the Shōnan coast's urban surfing core. One of the striking things about hitting the waves in Shōnan is that it's a bit like riding a crowded Tokyo subway train: Although the lineup may be packed, people manage to maintain a bubble of personal space. Scanning the grassy dunes and parking lot—empty in these onshore wind conditions but usually packed with a hundred or more surfers when it’s going off—I try to picture the scene that will happen here in just a little over a year, with a warren of tents and bleachers buzzing with action, loudspeakers blaring and TV cameras everywhere. Because although you sure wouldn’t know it to look at it today, some-time in late July or early August 2020, at this very spot—Shidashita Beach (or just “Shida” to surfers) in the Chiba prefecture town of Ichinomiya—someone is going to win the first Olympic medals ever awarded for surfing. in home surf when Olympic history is made here. In the living room of their spacious, memorabilia-filled home by a river a few miles inland from Shida, legendary surfboard shaper Teruo “Ted” Adegawa and his wife, Yuriko, reminisce as they leaf through a book of old photos from Ted’s long shaping career. There he is in Southern California in 1964 during a year-long road trip around the United States, when he learned to surf and shape boards. And there he is setting up shop as one of Japan’s first local shapers at a time when the only boards available were brought in by American military guys serving in the country. Pro surfer brothers Yukio and Nao Ogawa, along with Nao’s son Takuya, get ready to hit the waves at their home break in Kamogawa, a mellow city fronting a curving bay in southern Chiba. One day about fifteen years ago, Ted was on his way home from a surf contest when a blood vessel suddenly burst in his brain (the fruit, he says with a wink, “of too much drinking shochu”). He was in a coma for months and was left partially paralyzed. Unable to surf, he turned to golf. But a couple of years ago he started riding waves again, lying down on his board. Soon after, he started Japan’s first adaptive surfing organization with the aim of helping surfers with disabilities get in the water. This September he organized Japan’s first adaptive competition, with more than twenty surfers coming from all over the country to participate. Trim, spry and still ripping at 70, early international surf star Mikio “Mickey” Kawai sits amid a clutter of mementos in his Surf Gallery in Kamogawa, a small beach city along a curving bay in southern Chiba. The small shop is packed with trophies, old boards and framed photos of Mickey shredding in seemingly every surfing era. The preferred mode of transport for Shōnan surfers is the beach cruiser bike with surf racks on the side. For the masses of train surfers coming out from Tokyo, there’s a thriving local industry of storage lots for bikes and surf “clubs” offering board lockers. In the early ’60s, Mickey tells me, he saw surfing on TV and tried to copy it using a blow-up air mattress. The first time he surfed for real, he says, was when he was finally able to borrow a board from an American Navy guy. After that he and his friends began trying to make their own boards, but, like Ted, they couldn’t find materials anywhere. “One of my friends even hired a detective to help find materials in Tokyo,” he laughs. Out on the wooden deck of Splash Guest House overlooking a gorgeous stretch of beach in the central Chiba village of Hebara—often referred to as “Japan’s North Shore”—half a dozen women in billowy hula skirts are swaying in unison to Hawaiian tunes emanating from a boombox. Splash’s proprietress, Madoka Gillett, is a member of the local Hilo Hawaiian Academy hula troupe—one of many in hālau (schools) hula-mad Japan—and today she’s hosting practice at her Hawaiiana-filled home. Meanwhile, clean little peelers are unwinding off the beach out front, where when the right swell is on, world-class grinding cylinders can pour in. From the early 1980s through the mid-2000s, this area helped spark a surfing boom in Japan as it hosted annual top-level competitions on the world championship tour. For a few weeks each year, the sleepy little town was transformed into surf circus central, with the sport’s biggest stars roaming the narrow streets and family shops. “Most awareness of surfing in Japan started with those contests. Before that there was the idea here that surfing wasn’t something you did; it always sounded a bit suspect,” says Madoka’s effervescent husband, Dane, a snowboarder from Wales who first came to Japan twenty years ago to compete and fell in love with it. A surfer as well, Dane started searching for info on surf spots in the country and came up empty. So for the next decade he traveled and surfed the length of the island nation’s thousands of miles of coastline, filling pad after pad with notes. Eventually he put it all online at SurfingInJapan.com and other web sites, and about five years ago he and Madoka started their guesthouse and surf school at the hard-to-land prime ocean-front spot in Hebara. It’s a sunny Sunday afternoon at Kugenuma beach, and hordes of wetsuit-clad Tokyo “train surfers” are swarming the small, blown-out beach break like ants on a sugar trail. With its warren of narrow streets fronting a long stretch of usually gentle beach breaks about an hour from Tokyo by train, Kugenuma is the epicenter of the urban surf scene on the Shōnan coast, a twenty-five-mile stretch of beach towns along Sagami Bay in Kanagawa prefecture. Taisei Akiyama waxes his board before heading out for dawn patrol at Shida, which hosts so many surfing contests throughout the year that it’s known as the “dojo” of Japanese surfing, after the competition ring in sumo wrestling. Dozens of beach cruiser bikes fitted with surf racks stand in rows by the sand, with a pair of rubber slippers neatly tucked behind each rear wheel. Down the beach a festival of some sort is in full swing, with big tents and blaring loudspeakers. A few people are playing paddleball over nets set up on the sand, while others lounge on the long arc of concrete bleachers fronting the beach. Offshore to the left is the steep profile of Enoshima island, the “Diamond Head” of the Shōnan coast, and in the distance to the right, Fuji-san soars high above the cloud line. Smack in the middle of all the action stands the three-story, flamingo-pink Coastline surf shop. The shop’s owner, Tenji Oda, tells me he’s been surfing for fifty-five years, and like many early Japanese surfers he first learned about it from magazines. He tried it out with friends who had gotten boards from American servicemen, and he got hooked. But when he went looking for a board of his own, he says, there were no surf shops. When he finally found a place to get a board in Tokyo, it cost about $1,500, several months’ salary for most people at the time. “Back then it was only a rich person’s sport,” he says. Oda owns the three-story, flamingo-pink Coastline surf shop in the heart of the action at Kugenuma beach. When he took up surfing in the seventies there were no surf shops in the area. Oda recalls traveling to Tokyo and paying a premium for his first board. Oda with his buddy Masanobu Sano who co-founded the surf club Kugenuma Easy Underground. “We called it ‘Underground’ because we were about surfing culture, not contests,” Sano says. One of Dove’s prime stars over the years, Takayuki Wakita, is sitting at a picnic table out in front of his family’s surf shop on bustling Enoshima beach, showing me a sick shot on his phone of him tucked super far back in a macking Pipeline barrel last season. In his trademark helmet, Wakita is such a notorious charger at the North Shore proving ground that the insanely deep peak where he takes off (and frequently gets pounded) has been named after him. Competitive surfer Reon Oba catches a wave off Kugenuma. The small beach town is the epicenter of the urban surf scene on the Shōnan coast due to its proximity to Tokyo – only an hour’s train ride away. Like most of the proliferation of surf shops along the Shōnan coast, the Sylphide Surf Club, which his parents have owned since he was a kid, does a lot of its trade in rentals and board storage for Tokyo surfers who ride the train out to the beach. As we talk there’s a steady stream of weekend warriors lugging equipment in and out of the storage lockers in the basement. Mount Fuji looms over the line-up on a clear day at Kugenuma. Seasoned pro Masatoshi “Mar” Ohno sits with several other coaches under a pop-up tent in a light rain, watching a pack of young hopefuls rip turns and boost airs in wobbly, head-high Chiba beach break as they warm up for a regional junior championship. He’s sporting the Japanese flag on his uniform cap and windbreaker, thanks to his recently assumed role as non-surfing captain for Team Japan in the Olympics-affiliated International Surfing Association. The 38-year-old Mar says his role is “to help everyone bond together as a team, because they’re more used to approaching surfing as individuals.” He must be doing a good job, because earlier this year the team won gold for the first time at the ISA’s 2018 World Surfing Games, held in Japan. A few weeks later they took gold again in the junior championship.